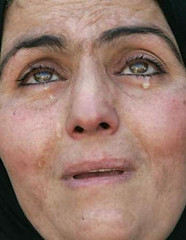 A woman cries as she waits to claim the body of a relative, killed in a mortar attack on Monday, outside Yarmouk hospital morgue in Baghdad, March 13, 2007. The attack killed two persons and wounded 15 others, police said. and the night wept only blood. there will only be hatred cloaked in colors of death.